Usain Bolt on Thursday broke the men's 200 meters world record by 0.11 seconds at the world athletics championships as he became the first man in history to hold both 100m and 200m champions of Olympic Games and World Championships. 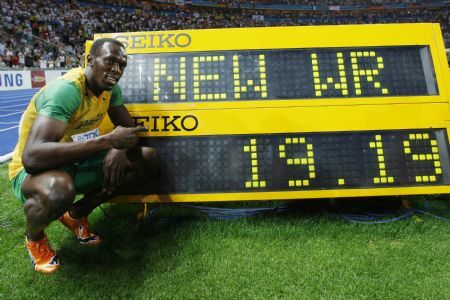 The Jamaican, who broke the 100m with 9.58 seconds, clocked 19.19 seconds to break his own record of 19.30 set at last year's Olympic Games in Beijing. 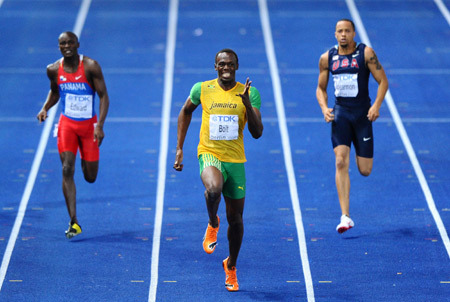 But Bolt said soon after the win that he will break another world record, in the men's 4X100m relay. "I am ready for another world record with our relay," he said. "But I don't know whether my teammates are." He added, "I do this for my country. They are crazy for me and pround of me. I am honored to do this for Jamaica." Bolt broke three world records at the Beijing Olympics and it will not be a surprise for him to break one more at the worlds in Berlin. "I said early in the season that I had to get my start right. I worked on it. That was the key in this final. I got my start right. "I definitely showed people that my world records in Beijing were not a joke. I showed people what can be achieved with hard work and dedication." Panama's Alonso Edward took the silver in 19.81 and American Wallace Spearmon was third in 19.85.